A busy day for the stable with Rhythm To Spare, Lord Barrington and Saracino running at Moonee Valley. Lord Barrington is the first to go in race four, the Silver Thomas Hanley Plate over 1200m where he will be ridden by apprentice Zac Spain and jump from barrier seven. The son of Darci Brahma was only narrowly beaten over 1000m on a heavy track at Sale at his last start on May 23. “It will be a soft track which is ideal for him,” Moroney said. “He’s drawn out a bit but I’m expecting him to fly the gates and put himself right on the speed. “We think the claim puts him in the race with a chance, he’s had a bit of racing now and is rock hard fit. Saracino is on the quick back-up in race five, the Catanach’s Jewellers Plate over 1200m with Patrick Moloney to ride and drawn barrier eight. Saracino was his own worst enemy and went too hard in the lead last Saturday over 1400m at Flemington but has come through the race in good order. “His blood is great and all we’ve done with him during the week is trot and canter,” Moroney said. “The genuine soft track will be ideal for him so I was happy to back him up. “It does look a decent race but the conditions are in his favour and he’s well in himself so again, if he turns up with his A-Game then he can be in the finish. Rhythm To Spare (pictured) runs in race nine, the Travis Harrison Cup over 1600m with Zac Spain to ride and jumping from barrier 11. “We’ve put Zac Spain on to reduce the weight,” Moroney said. “The barrier is the concern and we’ll need some luck from there. “The ideal will be to get a spot behind the leaders or outside the lead. 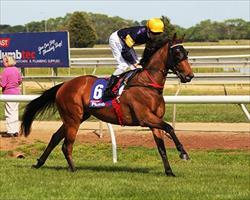 He’s bounced through his Adelaide run in great order and his gallop on Tuesday was terrific.